If you like hot and spicy food than this is just for you.It's really good as well.This is a recipe that I came up on my own. I made a few chances to this recipe. Brown the ground beef, sausage, onion and season with salt and pepper.Drain well. In a pan add the water and once it comes to a boil add the rice.Let it set for 5 to 10 minutes.Add it to the beef mixture and mix well.Add the chili powder, garlic powder, package chili seasoning and tomato sauce.Mix well. Microwave the flour tortillas for 1 minute.Pull the tortillas out and add enough meat mixture and optional add enough salsa and sour cream.Enough shreddar cheese. Fold like a burrito or could use hamburger buns. 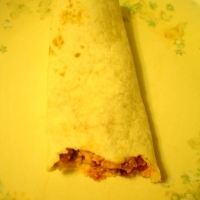 See Chili Burritos for more flavorful mouthings. Is there a typo on the rice or water amount?